As I begin this I need to repent before the LORD and to you for not getting this out to the Body of Christ sooner. Please forgive me! Ever since this divine revelation was given, I have been sobered, awakened and running with this vision, releasing the truth of His delivering power to deliver us from the tables of the enemy of our soul. 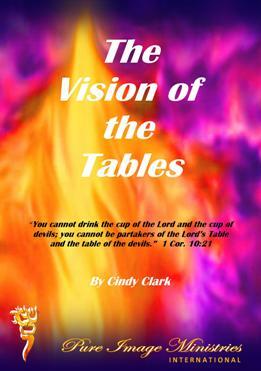 As I have shared with the multitudes this vision, so many have been awakened to see the tables of the devil at which they are eating. They are confessing them and being delivered. We have seen multitudes everywhere turning demonic tables over and being delivered and set free. We have also seen God use this powerfully in doing many prophetic acts, such as the golden table of the Lord on one side and the black table of the devil with all the different words on the plates, even in different languages. There are really no words to describe how God’s Holy Fire is falling as the truth of His radiant light breaks through into many souls. To God be all the GLORY!!! Please read it, digest it, share it and teach it everywhere you go. And in this time I am exposing all the falsehoods, all the lies, and all the self-deception that you have walked in. I am taking the covers off of the unholy ways, the attitudes, the thoughts, the intents and all of your motives that you have let live in you for many years. Because of My mercy and for My Glory, I am showing you by unveiling My holiness afresh to you. I am showing you all your false altars, all your self-altars, all you have built in place of My true Altar of worship. All of the places that you have loved and served selfish desires instead of choosing to lay down your lives for a real love for Me. Not by what you do for Me but for who you are in Me is what I am looking for. How you are led by My Holy Spirit. How you choose to live in an ascended place with Me, choosing My love, My humility, My completeness and My wholeness--these that will allow you to live in harmony with Me and with each other. Take heed, Beloved that the light that is in you is not darkness. (Luke 11:35) For so long you have measured yourselves against one another, walking in pride, presumption and arrogance; judging one another and even pointing the finger; spreading the poison of fear and suspicion and even a covenant breaking spirit and ways to many that are around you. You see, in this time I am looking for those whose hearts are perfect towards Me and towards each other. Love is the ultimate key that unlocks the heavens in your life. I Am Shining My Radiant Light! Will You be My Fire Door in 2014? Will you not be ashamed of My fire and My passion and My purity in Who I Am? Will you love Me with a passion that is never dying and never ending? And will you not shrink back and try to put your light out when the persecution comes but instead will you let it grow brighter? I need fire brands in this hour! 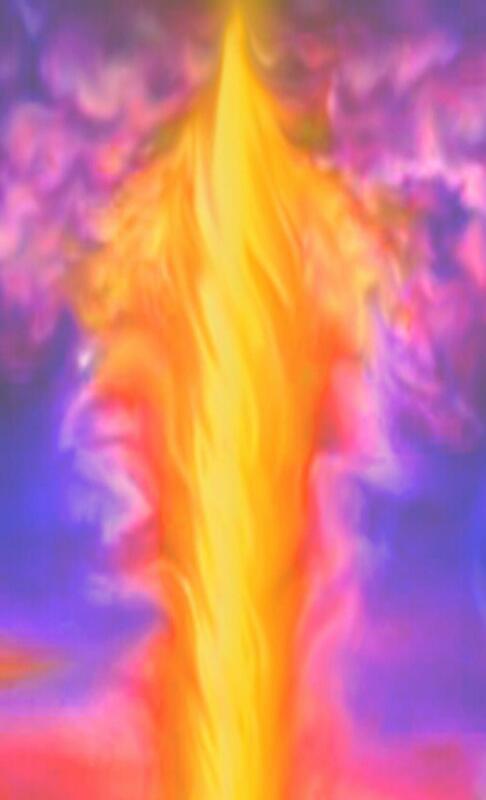 I hear the Lord say He is going to catch us up in His pillar of Fire. He is going to make it as a portal that we are going to be caught up into and He is going to give us things to release, even stones of fire, coals of fire, words of fire. I see trumpets and shofars that release fiery rivers here. He is going to be known as the God of Fire. I see keys of fire! And I see the keys to even take, not just to open with but to close false fiery doors.